Ranging from delicate and vintage to whimsical and cute, these teacup embroidery patterns are perfect for stitching as you enjoy a cuppa. And not only can you stitch a teacup design that's perfect for Mother's Day, but you'll also be able to embroider some useful tea time accessories for every day. You're sure to find something that's just your cup of tea! This sweet tea shelf pattern from Jenny of Elefantz features a shelf with a cloth covering, a cream and sugar set, plus two delicate teacups. The PDF includes the pattern in two sizes, so you can choose a version that will work for your next project. The triangular design of the shelf covering makes it perfect to add to the corner of a cloth for your tea table! If you love a bit of whimsy at your tea party, you'll love Ink & Ocean's set of teacup embroidery patterns. They're inspired by vintage and ethnic teacups, and with all of the decorative lines, these cups would be a great start for making your own sampler. Based on actual vintage teacups, this trio of free patterns is easy enough for a beginner, while offering interest for more experienced stitchers. They're just the right size to frame individually in small embroidery hoops, but they would also look wonderful along the edge of a tea towel. Designer Cathie Richardson of Country Garden Stitchery offers a unique set of four embroidery patterns, each featuring a teacup with a different kind of flower spilling out of it. Use them together, separately or working bits and pieces from the different designs. She includes color notes with the patterns so you can follow her examples, but also suggests that they would look great in redwork. 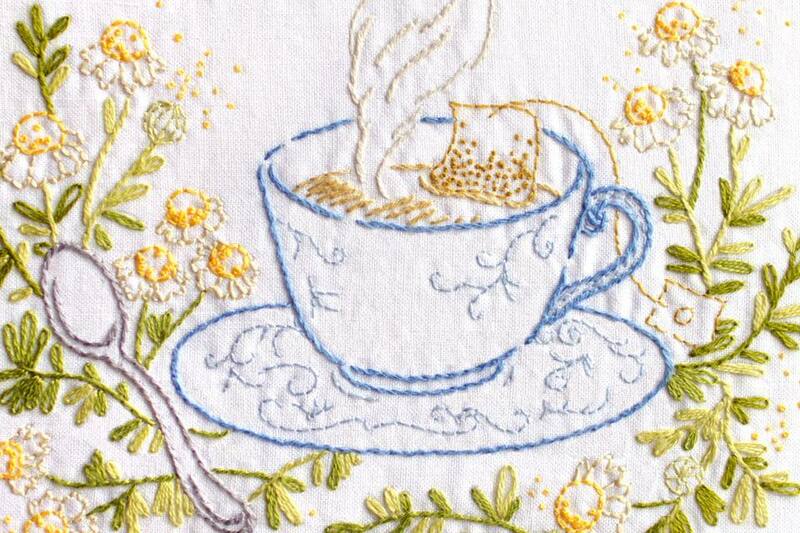 It's not uncommon to think of vintage things when you think of teacups, and this free pattern is part of a set of vintage tea party embroidery patterns. Shirley of Hudson's Holidays offers these downloads through a series of posts, starting with the teacup and saucer. There's also a teapot, ​sugar bowl, creamer, and a few others that you can find by searching for tea on her site. Does a cup of tea make you sing? It does for this sweet robin perched on the edge of a teacup! Tea Time Song is just one of the many teacup patterns from Bumpkin Hill. Each design features a little critter peeking out of a cup, a teapot or even sitting atop a tower of tea time treats. These bunnies, for example, are absolutely charming. She even has note cards that match! Just as a cup of tea is soothing, so is a joyful heart like good medicine. Based on a proverb, this complete embroidery kit from Clementine Patterns contains everything you need (minus scissors) to make this beautiful piece of stitching. If all you need is the pattern, you can buy only the pre-printed fabric panel. Surely the stitching will bring you a joyful heart that's as healing as a cup of tea. This sweet little teacup may just remind you of Chip from Beauty and the Beast, but it looks to be in pristine condition. Mollie shares a free pattern (along with the matching teapot) over at Wild Olive. She offers color suggestions, but the simple design makes it easy for you to choose a color palette that suits your own style. While the teacup is just a small part of this strawberry tea pattern, you'll love stitching the design onto a tea towel and possibly embellishing it a bit further. Shown in greenwork, the plate of strawberries, teapot, and teacup are a quick stitch. Amongst a collection of vintage potholder patterns and projects, you'll find this teacup embroidery pattern. The pattern is designed to create a shaped potholder, but it would also make an excellent mug rug for your morning cuppa! Just stitch the inside details onto wool felt and then cut out the shape, following the outer line. Full instructions are included at Tipnut.